Turns out the Woodard family was making furniture in Michigan for as far back as the 1860s. Descendent, Russell Woodard started designing with his two brothers in the 1930s and he was a fixture of the Mid-Century Modern era. The Woodard Furniture company still makes patio furniture today, though it’s no longer owned by the Woodard family. I have to tell you, this is one seriously comfy little settee. Many a day or evening, I curled up to read a good book and found myself dozing several hours later. It’s extremely sturdy and the outdoor elements don’t seem to do anything to it at all. 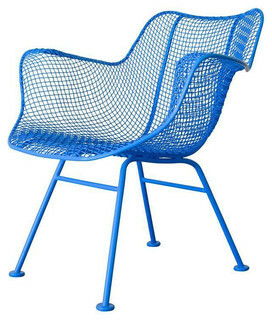 Then there’s the famous ‘sculptura’ chair made of wire mesh. Woodard’s fiberglass and wire mesh pieces look terrific painted out in bold colours. This mid-century piece was in amazing condition, so it needed no help in the paint or structure department. However, it came without any cushions. I searched high and low for a settee cushion that would fit. I finally discovered that Pier 1’s Calliope outdoor settee cushions intended for their wicker furniture are a perfect fit! It was a little pricey at $90, but considering the settee was free for me (and even if it weren’t free, it’s so nice, it’s worth the price) I jumped on it. I chose the soft blue “Maui” fabric to go with my ‘island eclectic’ deck theme. The great thing about Pier 1 is that they don’t seem to ever change their cushion shapes; I had an old 1980s Pier 1 wicker chair–my very first piece of furniture that I bought in my teens–and I was able to get a new seat cushion to match the settee 25 years later! As for the decorative cushions, they were a fabric remnant from my old bench cushions which I cut up to make little throw pillows for the settee and the chair. Based on my internet research, it’s tough to find these in black (they’re more often in white, but black is definitely this one’s original colour), and it’s tough to find them selling on their own. They often come in sets with the dining tables and chairs or side tables. Seems rare to find them with cushions as well. Woodard’s metal furniture pieces are considered more valuable and sets can go for as much as $4000 at auction. About the designer, Russell Woodard and some past auction prices.